The Handheld XRF Analyzer is a most practical elemental analysis solution for many industries and types of material. Bruker® handheld XRF analysis guns have boosted productivity and profits for many businesses all over the globe. Bruker Inc. has been a trailblazer in XRF technology since 1982. Please contacts us through the form on the right to learn which of Bruker’s handheld XRF models is the best answer to your analytical requirements and why a handheld XRF gun is a valuable business asset for you, to schedule a free demo, or for a prompt quote. XRF stands for X-ray fluorescence, which is the name of a type of radiation used in material spectrometry. So-called “secondary” or fluorescent “X-rays” are generated by an analysis sample when irradiated with high-energy X-rays. The atoms that make up the material are elevated from their normal or “ground” state to a state of higher energy (called “excitation”). The emitted X-ray fluorescence can be read and interpreted by an XRF spectrometer. This is the basis of XRF analysis, simply put. X-ray fluorescence is produced instantly; what takes a tad more time is the analysis of it, which reveals the material’s elemental makeup, i.e. the proportions (by weight or expressed in ppm) of the constituent chemical elements. The characteristic atomic X-ray fluorescent spectra of the constituent elements serve as their identifiable fingerprints, making qualitative XRF analysis possible. The intensity of XRF is proportional to the amount of the element present, which enables quantitative XRF analysis. A leading new-generation handheld XRF analyzer such as the “point-and-shoot” Bruker S1 TITAN™ typically takes a few quick seconds, 2-3 or sometimes more, per sample tested, although an exhaustive ppm scan may require full minutes. Today, advances in XRF technology pioneered by Bruker have dwindled the gap in precision capability between our handheld XRF analyzers and those big immobile laboratory machines that until recently used to be the only accurate way to do material analysis. With Bruker, you can analyze materials in situ anywhere. The instrument’s body, ruggedized with rubber over-molding, is impermeable to moisture, dust or dirt ingress, protecting the analyzer in adverse field environments (the S1 TITAN is IP54 rated). A sample stand is optional for the scanning of small or complex samples. The Bruker S1 TITAN product family can use predefined calibrations (for alloy, gold, precious metals, bulk material, mining, soil, restricted materials); custom calibrations are also possible. Please let us know your requirements. A Bruker product specialist will be glad to address your query. Welcome to the Bruker S1 TITAN™! It is a robust instrument. Weight:1.5 kg or 3.3 lbs(including battery). Extremely fast and accurate. Very low Limits of Detection (LOD). Equipped with a Silicon Drift Detector (SDD), a lucid integrated touchscreen, a 50 kV X-ray tube, SharpBeam™ optimized X-ray geometry, and SMART Grade™ timing. It comes in five different models – 800, 600, 500, 300 and 200 – one of which will correspond best to your needs. 800 and 600, the best in class, have a large area CUBE™ SDD detector, ensuring top performance. 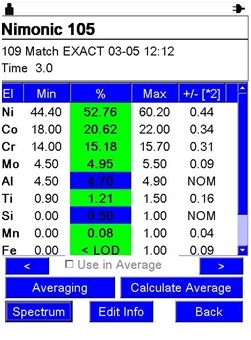 500, with a standard SDD detector, is accurate and offers best value for run-of-the-mill industrial elemental analysis. 200 and 300 use a relatively inexpensive SiPIN detector. Get in touch with Bruker Inc. to find out more! The S1 TITAN handheld XRF analyzer has a thrilling feature set! Bruker’s patented SharpBeam™ Optimized Technology (patent # 8,223,925) enhances quantification precision; produces a sharply defined measurement spot; lowers power intake and lengthens battery life. Importantly, SharpBeam™ also reduces the instrument’s weight. The S1 TITAN 800 and 600 utilize our elite, large-area Silicon Drift Detectors(SDD) for lower LoDs, improved counts and resolution. One benefit worth mentioning is the new found ease of light element analysis, which no longer required vacuum or helium purging. When acquired with an Alloy calibration, the 800 and 600 come fitted with Bruker’s patent pending SMARTGrade™ application, which automatically calculates the optimal conditions and analysis times for each sample. This is like having an analysis expert at your disposal all the time, all you do is point and pull the trigger. Only minimal training is required. A handheld XRF analysis takes 2-3 seconds for standard alloys and 10-30s for alloys with light elements. Optionally available with these two models is an Integrated camera. Another optional feature (800 only) is a small spot collimator. (All the S1 TITAN models use the default 5mm spot size, but 800 can be configured with an 8mm or 3mm spot). Send us your query now! Bruker handheld XRF analyzers are enabled with powerful data processing, handling, and storage. Elemental spectra, images, sample id’s, and XRF analysis results are stored in a single protected file for ease of access, and scan results are available in both a protected and unprotected (exportable) file formats. Export to MS Excel or another type of database is easy. Data is stored internally or on a USB flash drive or both. Analysis GPS coordinates are exportable to GIS compatible software. A portable, ruggedized thermal printer and a bar code reader are included. The robust software package includes a straightforward report generator; a spectrum viewer; a grade table editor and the ability to control the analyzer remotely. The point of securing a handheld XRF gun for your business is to reduce hassles and workload and to save money in the long term (those lab fees do add up heftily). The Bruker handheld XRF analyzer is an attractive instrument that works smoothly and efficiently. 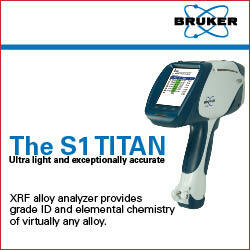 Contact Bruker for more information or a free demo on the handheld XRF S1 TITAN spectrometer. We are standing by for your query. Was the information in this article helpful? You may also it useful to check out our info pages XRF analysis and the various XRF applications of a handheld XRF analyzer. We would love to hear what you think. Please write to us today with your questions or comments!